Viet Nam Vets MC is an International Organization with members in Europe, Canada and the United States. We have members in all 50 states including Alaska and Hawaii. Viet Nam Vets MC is made up of two compatible groups of former US military men. Those who served in the country of Vietnam and earned the Vietnam Service ribbon. Those who served honorably in the US military during the Vietnam Era and earned the National Defense Ribbon. Bonded by history, and united by principles to form a proud and unique Biker Brotherhood, the Viet Nam Vets Motorcycle Club. Viet Nam Vets MC contributes our energy, time and resources to an effort that will build a better future for all veterans and their families. Our first and primary mandate is to do everything within our powers to bring our POW/MIA Brothers home and to insist that our Government demands accountability for each and every one of those patriots. The Viet Nam Vets MC continues to honor our sworn solemn oath to defend and protect the Constitution of the United States against all enemies both foreign and domestic; and our inalienable rights & freedoms, which are the principles on which our country was founded. The definition of "Legacy" is a gift or Honor handed down through a family line. 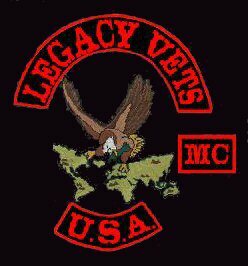 We the Legacy Vets gladly accept a gift of responsibility from our Viet Nam Vets Motorcycle Club Brothers. They’ve come before us and are entrusting us to carry on their visions, principles and traditions well into the future. We, the Legacy Vets Brothers are ALL active duty Military or Veterans who’ve entered the American Military and served Honorably after December 1975. Our primary mission is to do whatever is necessary to bring our POW/MIA Brothers home from ALL Wars and to insist on full accountability from our elected officials. As advocates, we participate in motorcycle & community activities to draw public attention to the unique problems of all Veterans, especially the Vietnam Veterans.